Today's technology users are faced with an incredibly sharp complexity curve as products ranging from personal mobile devices to enterprise hardware and software evolve faster than users are able to understand and consume new product versions and features. Nowhere within technology companies is the pain of this avalanche of complexity felt more than in customer support. TSIA benchmark data shows that as product complexity has risen, overall service performance has fallen dramatically, and response and resolutions times are taking longer. Fewer incidents are resolved on the first interaction-meaning customer downtime is increasing and threatening to impact customer success and satisfaction. In an attempt to reverse this trend, support organizations have invested heavily in technical training for support representatives, and in knowledge management tools to help support techs find a needed answer quickly. Unfortunately, both approaches have proven inadequate. New support technicians are now spending almost six weeks in training their first year-very expensive ?off phone? time-and TSIA members report high dissatisfaction with existing knowledge management systems. 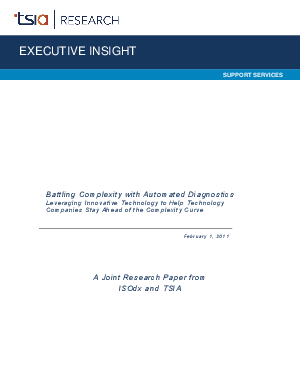 Innovation is the answer, and this report will describe innovative technology from ISOdx Solutions which can quickly analyze an enterprise's entire technology infrastructure to find the cause of a system failure or outage in minutes, doing what would take days or even weeks to accomplish manually. Support executives must look beyond their own walls for expertise in battling complexity, leveraging technology from suppliers with a track record of high performance and innovation to not only cut operating expenses for support, but to vastly improve the service experience for customers.